The public is invited to tour sections of the newly restored Salt River watershed on Saturday, November 3 from 10 a.m. to 2 p.m. at the Veteran’s Memorial Hall, 1100 Main St., Ferndale. This will be a chance to see the restoration project’s work firsthand, learn about its future goals and meet the organizations involved. Lunch will be provided. Admission is free for this event, which will be held rain or shine. The Salt River Watershed Council and the Humboldt County Resource Conservation District are sponsoring this event. The Humboldt Transit Authority is providing bus transportation to the tour sites. Humboldt Grassfed Beef and GHD consulting services are providing lunch. For additional information, send an email to info@saltriverwatershed.org or go to the Salt River Watershed Council website at www.saltriverwatershed.org. Click to view the newsletter. The latest issue of the Salt River News is now available online. The public was invited to tour sections of the newly restored Salt River watershed on Saturday, November 4 at the Veteran’s Memorial Hall in Ferndale. This event was a chance to see the restoration project’s work firsthand, learn about its future goals and meet the organizations involved. 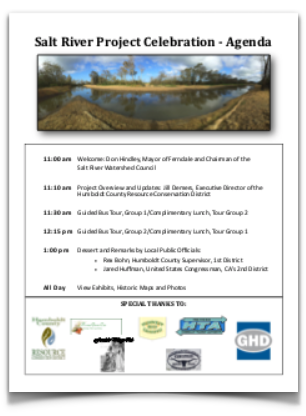 The Salt River Watershed Council and the Humboldt County Resource Conservation District sponsored this event. It was made possible by a grant from the Rose Foundation. The Humboldt Transit Authority provided bus transportation to the tour sites. Humboldt Grassfed Beef, No Brand Burger Stand and GHD consulting services provided lunch for the attendees. View photos from the event here. View the event program here. Read the KIEM-TV article here. View Congressman Huffman’s comments here. The water flowing into the Eel downriver from the bridge is most of the Salt River drainage from the east side of 211. This includes Williams Creek, Upper Salt river, and Coffee Creek. This story appeared today in the Times-Standard online edition by Hunter Cresswell. Work crews began dumping rocks at the southern abutment of Fernbridge on the Ferndale side Monday to mitigate erosion and scouring caused by heavy rains this winter. According to Caltrans District 1 public information officer Eli Rohl, over the next three weeks between 1,000 and 2,000 tons of rock will be built up on both the down and upstream sides of the riverbank. “The contract amount is for $3 million,” he said. According to the Caltrans District 1 Facebook page, Caltrans partnered with West Coast Contractors Inc. on the project. Rohl said scouring — the erosion of soil around the bridge’s support structures — is common on bridges that touch water. The rocks will reduce the velocity of the water so less earth is washed downstream, he said. “We’ve been looking at scouring at Fernbridge for a while,” Rohl said. Humboldt County 1st District Supervisor Rex Bohn said he’s been in contact with Caltrans over the past few weeks because he’s received numerous calls from Ferndale residents concerned about the erosion following the most recent heavy rainstorms. “That last storm rush took quite a lot of land out,” he said. Between a half acre and an acre were lost during those storms, Bohn said. Rohl said Caltrans didn’t have an estimate for how much land was washed away. Both Bohn and Ferndale city manager Jay Parrish thanked Caltrans for starting the project. “We had a number of conversations with Caltrans, Supervisor Rex Bohn and a number of other people that were concerned with the riverbank moving toward the ocean,” Parrish said. Rohl said there are no plans to disrupt traffic on Fernbridge while the work takes place. “There’s no public access to the river at that location,” he said. Adding the rock to the southern abutment of the bridge is only the first part of this project, Rohl said. Similar work must also take place on the bridge support column closest to Ferndale. The timeline for that part of the project will be determined when the river goes down and the flow slows, he said. Rohl said there is no damage to the structure of the bridge itself so it is still safe to drive. One day in January Caltrans closed state Route 211 at Fernbridge to vehicles due to the Eel River rising above flood stage and causing a hazard on the roadway on the Ferndale side. “The next (rain) event could have been the one to cause the problem so we’re ecstatic,” Parrish said. Bohn said he is happy to see the project underway. “Fernbridge is such a historic bridge and it’s important to the community,” he said. Access more information at facebook.com/caltransd1. Plant Native Trees Along the Salt River! 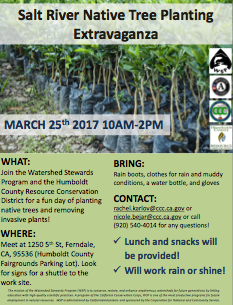 Join the Watershed Stewards Program and the Humboldt County Resource Conservation District for a fun day of planting native trees and removing invasive plants! WHERE: Meet at 1250 5 St, Ferndale, CA, 95536 (Humboldt County Fairgrounds Parking Lot). Look for signs for a shuttle to the work site. CONTACT: rachel.karlov@ccc.ca.gov or nicole.bejar@ccc.ca.gov or call (920) 540-4014 for any questions!  Lunch and snacks will be provided!  Will work rain or shine! A Very Successful Salt River Restoration Work Day! On Saturday, January 30, 2016 about 60 volunteers from across the Eel River Valley came together to plant native vegetation and remove invasive plants along the Salt River. The event was sponsored by the Watershed Stewards Program and the Humboldt County Resource Conservation District. Over the course of four hours, the volunteer crew planted 200 native trees and shrubs while removing invasive plants over three acres directly adjacent to the Salt River. To find out more about this event and view photos, go here. Yesterday, Barb and I drove out to several locations within the Salt River watershed. It appeared that Francis Creek was moving quickly, but staying within its banks from Firemen’s Park all the way through town to Van Ness. When we crossed 211 to check Ambrosini Lane, we were immediately stopped by high water on the roadway and in the adjacent fields from Williams Creek. We could not drive down California or Rasmussen roadways due to high-water levels. I would imagine that the folks living along Port Kenyon Road are heavily impacted by high water. By taking Fulmor Road to Goble Road to Dillon Road, we were able to access the Dillon Road bridge and view the Salt River. 1/17/16 Salt River at Dillon Road Bridge looking east toward Ferndale. 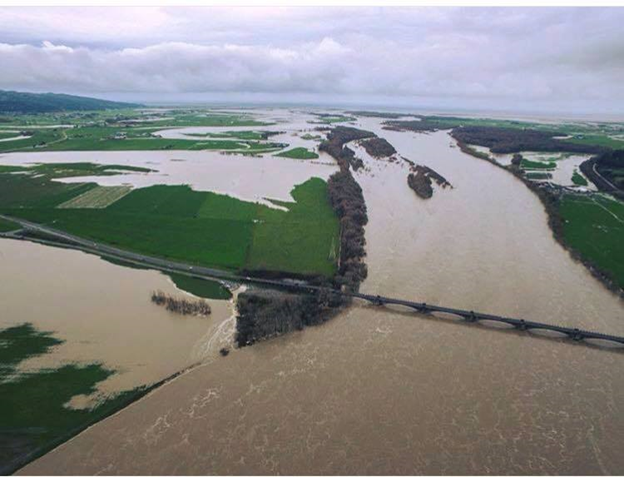 The Salt River was inundated with water from bank to bank and moving toward the Eel River. Yesterday’s rainfall levels were predicted between two and three inches. This morning, January 18th, Barb and I took a trip out to Fernbridge. The Eel River was above flood stage at approximately 21 feet. There appeared to be flooding on farm land directly adjacent to the river. As I write this post, another storm has begun to deliver more rainfall to the Eel River Valley. Rainfall is predicted to be no more than a tenth of an inch today, but more rain is on the way. The Watershed Stewards Program (WSP) is partnering with the Humboldt County Resource Conservation District (HCRCD) to host a volunteer tree planting and invasive plant removal event. The event will take place Saturday January 30th from 9:30 am to 2pm and will help with the upkeep and restoration of the Salt River. 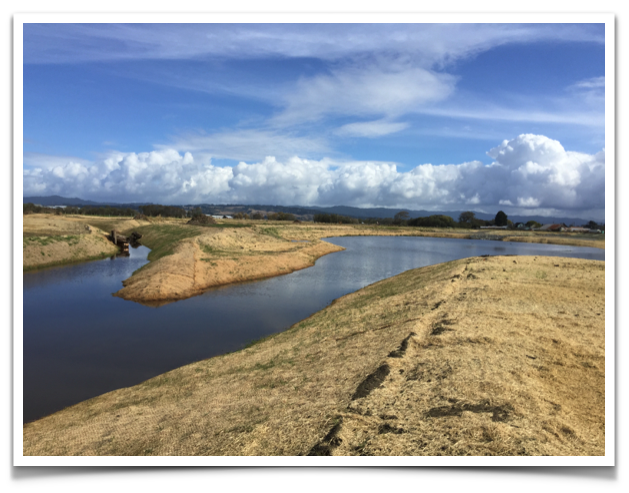 The upcoming volunteer opportunity with the Watershed Stewards Program and Humboldt County Resource Conservation District is a great way to get involved in ecological restoration and learn the history and significance of the Salt River watershed and the greater Eel River Delta. Join WSP and HCRCD by meeting at the Ferndale Fairgrounds (5th St. and Van Ness Ave.) at 9:30am on Saturday January 30th. From there volunteers are will take a seven minute shuttle ride to the work site as there is limited parking for private vehicles. A shuttle will be available upon request throughout the work day. Volunteers will spend the day planting native trees and shrubs, removing invasive plants and mulching disturbed areas to prevent sediment runoff into the stream. The event will conclude at 2pm after a free BBQ lunch is served. More information can be found and arrangements for large groups can be made by calling watershed steward member Emily at 530-514-8714 or email Emily.Moloney@ccc.ca.gov. The mission of the Watershed Stewards Program (WSP) is to conserve, restore, and enhance anadromous watersheds for future generations by linking education with high-quality scientific practices. 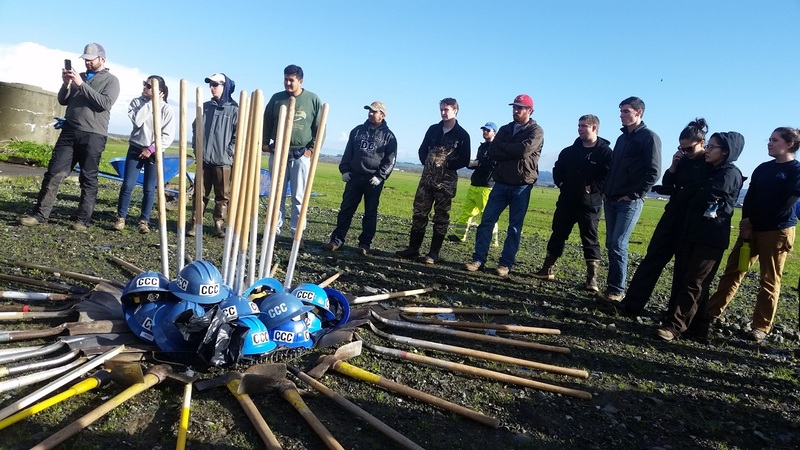 A program of the California Conservation Corps, WSP is one of the most productive programs for future employment in natural resources. WSP is administered by CaliforniaVolunteers and sponsored by the Corporation for National and Community Service. Congressman Jared Huffman and County Supervisor Rex Bohn answer questions about the Salt River project. Doreen Hansen, HCRCD, leads a tour group at the confluence of Francis Creek and the Salt River. Tour group at the Salt River’s sediment management area (SMA). Jeremy Svelha, GHD project engineer on the Salt River Ecosystem Restoration Project, leading a tour. A beautiful day for a Salt River tour! Thank you, Ronan and Mike Angelini of No Brand Burger Stand with helper, Kodi Millsap. Ferndale Garden Club volunteer, Barbara Vernon, helped serve lunch to attendees. KIEM-TV interviewed attendees as they waited to board county buses for the Salt River Tour. Jill Demers, Executive Director of the Humboldt County Resource Conservation District, delivered an excellent slide presentation on the Salt River Ecosystem Restoration Project. Over 100 folks attended the Salt River Celebration on Saturday, November 4.